2016 will mark the 21st anniversary of the founding of AMT. 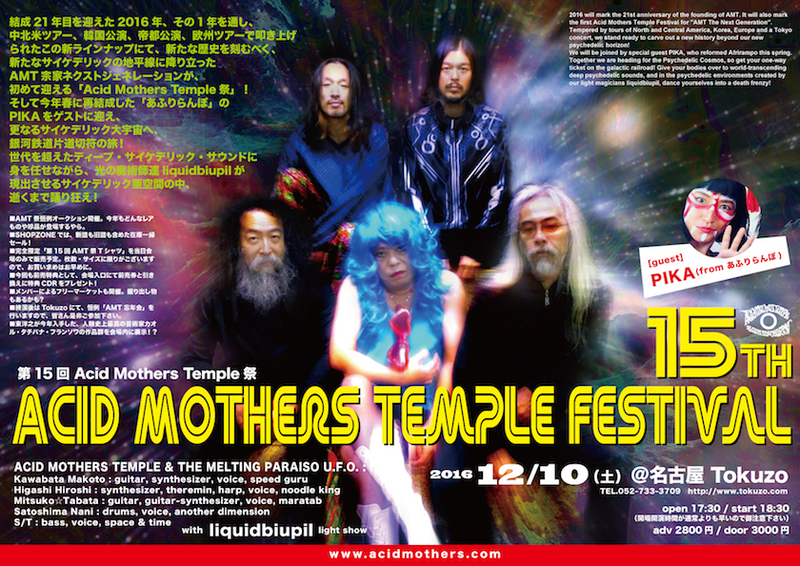 It will also mark the first Acid Mothers Temple Festival for “AMT The Next Generation”. Tempered by tours of North and Central America, Korea, Europe and a Tokyo concert, we stand ready to carve out a new history beyond our new psychedelic horizon! We will be joined by special guest PIKA, who reformed Afrirampo this spring. Together we are heading for the Psychedelic Cosmos, so get your one-way ticket on the galactic railroad! Give your bodies over to world-transcending deep psychedelic sounds, and in the psychedelic environments created by our light magicians liquidbiupil, dance yourselves into a death frenzy! ■ Including the auction. Who knows what rare items he has in his bag this year. ■ At the Shopzone a clearout sale of all current and old titles. ■ We will be selling the “15th AMT Festival” T-shirt. This will be highly limited so do not delay! ■ AMT member’s fleamarket. What hidden treasures can you find? ■ After the concert we will host the usual AMT end of year party. Please join us. ■ From Nagoya Station, take either the Higashiyama underground line towards Fujigaoka, or the Sakuradori line towards Nonami. In both cases, alight at Imaike which is about ten minutes from Nagoya Station. The venue is two minutes walk from exit ten at Imaike. ■ The gig will end by 22:00, because of noise limitation ordinances. Since The last Nozomi shinkansen bound for Tokyo leaves Nagoya station at 22:10, so we recommend that anyone who wants to travel back to Tokyo that night instead books the nightbus “Dream” leaving from in front of Nagaoya station at 23:30. There are other cheap night buses as well, leaving up till 24:15. ■ For those travelling from Osaka, the last Nozomi bullet train leaves Nagoya at 22:57. You will have adequate time to catch either one of these. ■ There are numerous cheap hotels both around Tokuzo and around the Nagoya Station area. However, since the gig wil be on a weekend it would be advisable to make a booking in advance. ■ Tokuzo will be open as a bar until 05:00 so it will also be possible to spend the night drinking there and then catch the first train home in the morning. There are many other drinking establishments near Tokuzo that stay open all night.